Not too long ago I had one of those good news, bad news travel days. The good news was that I was on a plane headed to Italy. The bad news was that I was not-so-luxuriously settled in an economy section seat. On balance, the joy of going to Italy definitely outweighs the discomforts of a long-haul economy cabin flight. Plus, I had taken advantage of an unusually low airfare to book a last-minute trip - an unexpected bonus. An upgrade would have cost more than the price of the ticket. So, I'm not complaining and I doubt I'd get much sympathy if I were! Instead, I thought this would be a good time to talk about surviving an overnight, transatlantic flight in the crowded back of the plane. If your airline offers it, pay for the extra leg room option. Even better if you can get it for free based on frequent flyer status. Those four extra inches of legroom really do make a difference on a long flight. If possible, choose an exit row. The seat in front will have limited recline, which means you won't have someone's seatback invading your space. Plus, it often has a bit more leg room. Use an app (for example Seat Guru) to research the best, and worst, seating options on any particular plane. Look for things like misaligned windows, fixed vs. moveable arm rests, proximity to bathrooms. Then, keep your own notes about plane configurations and seat preferences for future trips. Yes, I know this makes me a bona fide travel geek, but knowledge helps when choosing flights and seats. For me, an aisle seat is the best choice; it feels less confined and allows the freedom to get up and move around without stepping over, or waking up, a neighbor. If you are one of those lucky souls who sleep soundly on planes (like my father who once slept from just after boarding in Denver to touchdown in London) then the window seat may be a better choice, but I'll take the aisle every time. Stay comfy by wearing soft, non-binding clothes - not sloppy, just casual comfy. I'm a big fan of Chico's brand travelers, which look sharp, feel like PJs, and don't wrinkle. Leggings and a long tunic also look nice and wear well. Dressing in layers helps to overcome a too hot or too cold plane. A good size pashmina or other wrap serves as a shawl for warmth and a blanket for sleep. I keep one rolled up in my travel bag and never fly without it, even in summer. I use the provided airline blanket for my lap or legs but near my face I want my own wrap, one I know is clean. Added bonus: after the flight a pashmina is a great fashion accessory. Bring a neck pillow - those thin little airline pillows in economy provide little to no support and can lead to waking up with a stiff neck. A good pillow is especially important when trying to sleep in an aisle seat as you won't have the outer wall of the plane to rest your head against. 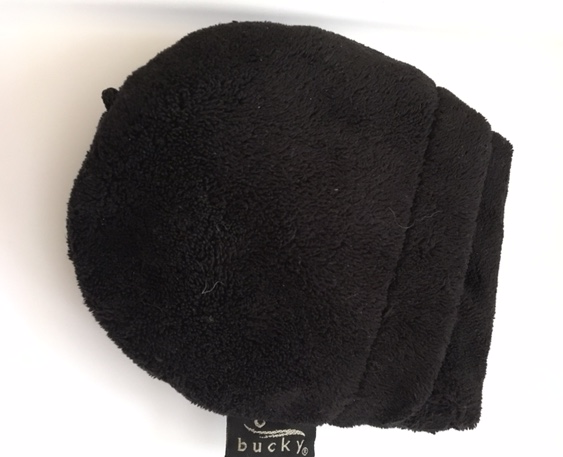 I know people who like the grain-filled neck pillows, but for me they are too bulky and heavy to carry; I prefer the inflatable type with a plush outer cover such as the Bucky brand pictured below. An inflatable neck pillow that collapses into a small, flat pouch, is lightweight and stores easily. Once on board, change into a pair of slippers with good soles. I like the little folding ballet flat type. Bare feet are not appropriate (very inconsiderate of neighbors) and socks alone are not a good idea, especially when making a trip to the overused lavatory, which often has a damp if not puddled floor. Yuck! Compression hose under the slippers are good and may help in preventing in-flight blood clots (along with staying hydrated, moving around, and leg exercises in-flight) as well as reduce swelling in the feet and lower legs. Isotoner brand ballet flat slippers slide into a carry on, have a good sole, and are machine washable. Bring a good set of noise-cancelling headphones or earbuds. It's possible to test the Bose brand at many airport kiosks. They are worth the investment, especially for frequent travelers, and can be used with both the in-flight entertainment system or your own device. Hint: Don't forget to charge them before your trip. BOSE noise-canceling headphones (left) and earbuds (right). The headphones are the "gold standard" for noise reduction in flight and are Bluetooth enabled; the earbuds are smaller, lighter weight and also provide good noise reduction. Music is my key to relaxation and sleep on board. Since my phone's music is in the cloud and not accessible in flight, I carry an iPod nano with my favorite music downloaded. The nano weighs practically nothing and fits in my earphone case or even in the smaller earbud case. I have my favorite songs for distraction (podcasts or audio books work well too) and a good selection of classical music for relaxation and sleep. The iPod nano with BOSE noise-canceling earbuds - small, lightweight, and it provides hours of music. Pack a nice snack (but no stinky foods). My go-to plane snacks are protein bars, pre-sliced apples, grapes, a wedge of Brie, some crackers, and a sweet treat, like a piece of shortbread. Airline food, especially in economy, is often unappealing, if not downright inedible. Having a stash of food that keeps well without refrigeration can be a life saver. To encourage sleep, avoid both caffeine and alcohol. While that glass of wine may make you sleepy at first, it's likely to interrupt your sleep down the road. Water is your best bet as an in-flight beverage. When ready to sleep, turn the TV monitor off and wear eye shades to block out light. Light is the enemy of sleep! Bring a book, magazine, or other diversion (print or electronic). Never count on the in-flight entertainment system (IFE) to keep you occupied; it's surprising how often they fail! Whether or not to take a sleep medication in flight is a personal choice; some people find them helpful (include me in this group) and others find that they don't make a big difference or leave them with a groggy hangover. One caution - never take one for the first time in-flight. Always do a trial run at home a few days before travel to see how you respond. All products shown are my personal property. Recommendations are based on my experiences and not on paid endorsements.